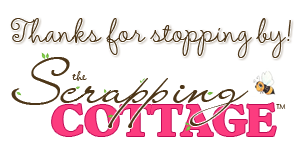 Hi, Lois here at the start of a new month It's October -- time for colorful leaves, pumpkins, and Halloween! Halloween is what I'm bringing you today. 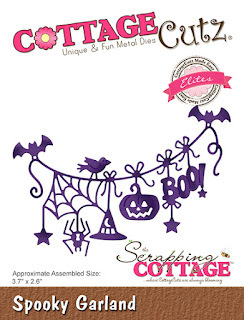 CottageCutz has a brand-new release of really cool Halloween dies -- currently on sale at 25% off, along with their Christmas (Part 3) release. I'm a big fan of fun-fold cards, and my card today is a relatively simple fun-fold card -- a Z-Box Fold card, using two of the new Halloween dies. Black - 4 1/4" x 5 1/2"
Orange - 4" x 9 3/4"
Patterned paper - 4 3/8" x 2 7/8"
Place the orange cardstock in your paper trimmer with the short side at the top and place the long side at the 1" mark. Cut a 1" slit from the 3" mark down to the 7 1/2" mark. Place the cardstock in your scoring board and score down to the cut line at the 3" mark, up from the bottom at the 7 1/2" mark, and all the way through at the 5 1/8" mark. Place Scor-Tape on the back of the largest section of the orange cardstock, as shown. Fold on the score lines and adhere to the black 4 1/4" x 5 1/2" panel. Cut three ghosts from the die. Color and construct the ghosts. Cut the Spooky Garland from a scrap of black cardstock. Adhere the patterned paper to the card base and sponge around the front panel. Add the ghosts and garland, and your card is completed. How cute are these ghosts. Beautiful! So cute! This card is adorable! 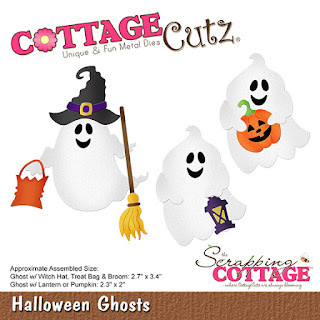 Love this Z fold perfect way to show off those cute ghosts!